I'm so excited to finally be giveaway one of these amazing Accuquilt Go! Baby fabric cutters. Not, only will one lucky winner get a cutter but also 3 free dies. I've shown you how easy they are to use. It made my yo-yo pillows a breeze. And, provided perfectly cut circles for our spider web headbands. Are you dying to have one too? 1. leave a comment with your name and email. 2. for another entry, visit the shop and tell me one of the dies you would pick. 3. for another entry, sign up for AccuQuilt emails, by clicking the link below. Once you're signed up leave a comment telling me you did. 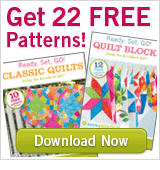 Once you've signed up for Accuquilt emails, you will receive 22 Free Patterns. SCORE! It's a win-win. Good Luck, this giveaway will end Sunday night at 10pm MST. I signed up for accuquilt's e-mails. I would love the sharon penderson rose dies! I can think of lots of uses for the circles! Oh WOW! I want one of these so badly, so I'm in for 3 tickets. - GO! Circle 2" 3" 5"
- GO! Square 3 1/2"
I would get the Carefree alphabet! I already get the email, does that count? I'm loving the go Birds!!! I subscribed to the emails!! My favorite die would be the airplane die - so cute! Would love to win- fingers crossed. Thanks for the giveaway. I would definitely get the go circles! SO many uses! I'd probably want one of the Geometric Dies -- maybe the half square? Because I've been wanting to start quilting and this would make it SO much easier! Oh hope I win! I'd love one of these! I think I'd pick a circular die and perhaps a tumbler- have always wanted to do a tumbler quilt! I would love a tumbler die. Thank for the chance! I love all of the dies but I would probably go with something practical like the circles! Great give-away - your pillows are fantastic. I am all signed up for the accuquilt emails! The go hexagon would be fabulous for quilting would save so much time. I think the alphabet dies would be super practical and many uses. Would love to win... just in time for some handmade Christmas gifts! Thanks! I'm dying for one of these! I would pick the circle die. I can think of a ton of projects I'd use that for! Signed up for the Accuquilt emails! To be practical, Id probably get either the alphabet, or something standard like the circles, but I really love that reindeer! I think a cutter like this would make circles a breeze. Count me in! Please Please Please let me win!!! Oh, wow! This is what I want! Thanks for the chance! I would definitely pick the circle die first. I could use it the most I think. I would pick circles or the alphabet. I would get tons of use out of either! Having three girls I keep eyeing these...nicole h.
I would start with the circle die...I've got plans for that one! I too would pick the circle, so many possibilities! Wow!!! I would love to win this! There are so many great ones! I love the alphabet and numbers, thinking felt boards to play with letters and numbers. Oh, and maybe a circle one, or a strip cutter. I so need one of these. I'd get so many projects completed, so much faster. I'd love to win it. I think the dies I'd get the most use out of would be the circles, hexagons and the alphabet. Subscribed to the email list - let the fun begin! Ohmy how I want one of these! I have been drooling over these for a while! I would so love to win one!! I love the critters, the rose of sharon, and the circles! I would pick the sleigh and snowflake die. This would be so fun to win this great tool!! I don't think I would get much done except playing with it if I won! I love the birds die and also the snowflake one! Oh my goodness! It would be so fun to have this!! Thanks! I would probably pick the circles or strips one. So useful for tons of projects. I am already signed up for the emails. awesome giveaway--thanks for the chance to win one of these nifty tools! the hexagon die in 2", 3', and 5' looks awesome!! I would really like to own one of these, I was just recently checking out the price & I only have half the money to buy one, so please enter me in your very generous giveaway ~ thank you !!! If I win this, I may not die, but I'll surely pee my pants. I've been wanting one sooo badly! Thanks for the chance! I'm pretty practical, so I'd want the 4.5" squares for starters! That would get me going on my first kids' quilt! Yippee! I would looooove to have this little machine!!! 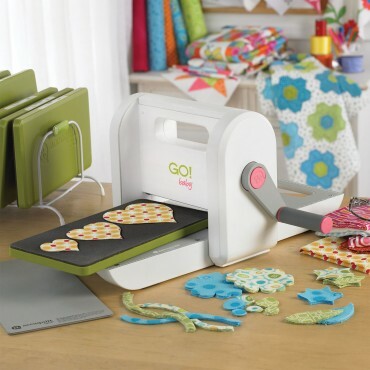 I have been wanting to get into quilting & this would really help! This is an awesome giveaway! I would love to win! I would use a lot the circles (2", 3" and 5"), the funky flower and the calico cat. Your pillows are soo cute. Thank you for the great giveaway. Ok, I have signed up for the emails too! I think I would want the Go! Pumpkin Die or maybe the apple core one. I like the Heather Feather #2 by Sarah Vedeler one. Super cute. I LOVE the sparkle-slim tree die! There are so many things I could do with that! I think I would have to go for some of the basics like circles and triangles. I have recently pulled out my sewing machine after it being packed away for some time and starting to use it again. I would want to by the reindeer die. He is so cute. I was just thinking about this today and how much I really wanted one. I'm making a super-cape for a super hero costume and it desperately needs stars on it. The Go cutter would make this process so much easier! I would pick any dye cut with a star or the apple core one. Both would be super useful. Oh, and I signed up at the website--I'm totally serious about getting one of those cutters! I receive the Accuquilt emails - love it! I would love to have the funky flower, tumbler and critters. I want a chance to win one! Thank you for this giveaway. I'll choose geometric dies, probably squares, hst and the tumbler. I think I'd chose the Go Critters. I would love to have one of these! (Just like every other person who has commented on this post.) I'm going to send the Random Number generator a bribe. ;) What do virtual web pages like for bribes these days? I would like the Go! Strip Cutter or Gingham Dog shapes! My favorite is the sleigh and snowflakes die. Awesome! I signed up for the emails from Accuquilt using my genelle at genny2118 dot oib dot com address. I actually think this would make me want to quilt! I love the 2 inch cutter, the apple core and the basic square and diamond shapes. I would LOVE this! The possibilities are endless! I would love the birds, the stars and the holiday accessories. The apple core is great as well. I've been wanting one of these thank you for hosting the giveaway! Oh how I would love to have one! Thanks for the chance to win! I love your yo-yo pillows! I'm sure the cutter made it MUCH more fun. Oh Baby Oh Baby Oh Baby, I mean GO Baby! I need you in my life, lol. I've been trying all year to win one of these!! I would love the hexagons and the strip cutters! I so want to win one of these! Oh, this looks like it would be fun! Thanks for a chance to win! I would pick the Rose of Sharon for one of my dies. It looks pretty versatile with 3 sizes. I signed up to receive the emails from AccuQuilt. I would pick the 2.5"strips, 5" squares and the tumbler die. I signed up for the emails already, they send out great sale emails often. I cant wait to get one!! I've been quilting with my grandma since i could remember! we would both enjoy this! Sandie A. nandiebaby@gmail.com, and i have signed up for their emails!! OH and i would pick the ribbon both for my grandmas cancer, and the steams and leaves die for the blankets we make to donate, working on a few to send to turkey. I am amazed at the constant evolution of technology! I would love to see this in action in my home. What a great giveaway really handy hoping to win! I just signed up for AccuQuilts the other day. What a coincidence!